Time Warner is looking for citizen journalist videos as CNN has launched a product called the CNN Exchange. 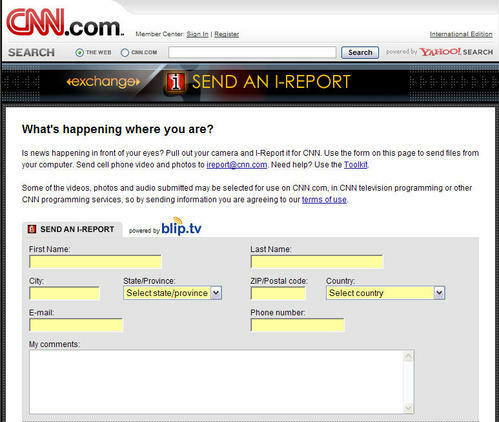 The exchange asks users to submit video footage for specify stories on the CNN site. The videos can be up to 30 MB. CNN will then moderate and display the videos it finds the most riveting. It should be interesting to see some of the videos that appear. The product is is powered by Blip.tv, an online video hosting and sharing service,which is mildly underrated and should benefit from the excellent exposure to a mainstream audience. There are a lot of skeptics of the move (UPDATE: many of which posted replies on this TechCrunch post), however I find it is a great move by Time Warner. They are a media giant but have made a number of innovative and creative moves in the last few weeks - I am sure there are more to come.